An escaped, telepathic slave. A bounty hunter with a secret. Can they free other thought-readers, the most prized slaves in the galaxy? Slave traders are abducting thought-readers from their haven world, then selling them on Syndicate space stations. There, telepaths have two choices: Steal secrets for their owners or face execution for the crime of existing. Every mission to infiltrate the space stations is a close encounter with death. To Tracy, a former slave turned undercover agent, and Vigard, her bounty-hunter partner, freedom is a cause worth fighting for. Even dying for. This epic battle against entrenched slavery is now available in a novelized version, which includes all eleven previously published short stories. 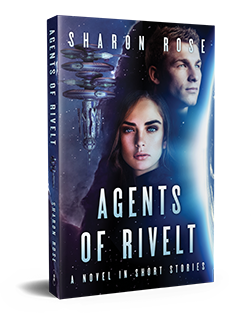 If you like rich characters, telepathy, and intrigue, set against a tapestry of alien culture, then you’ll love Agents of Rivelt.